With NASA’s MAVEN mission to Mars approaching launch it seems like a good idea to recount a past Mars encounter photographed from my backyard. 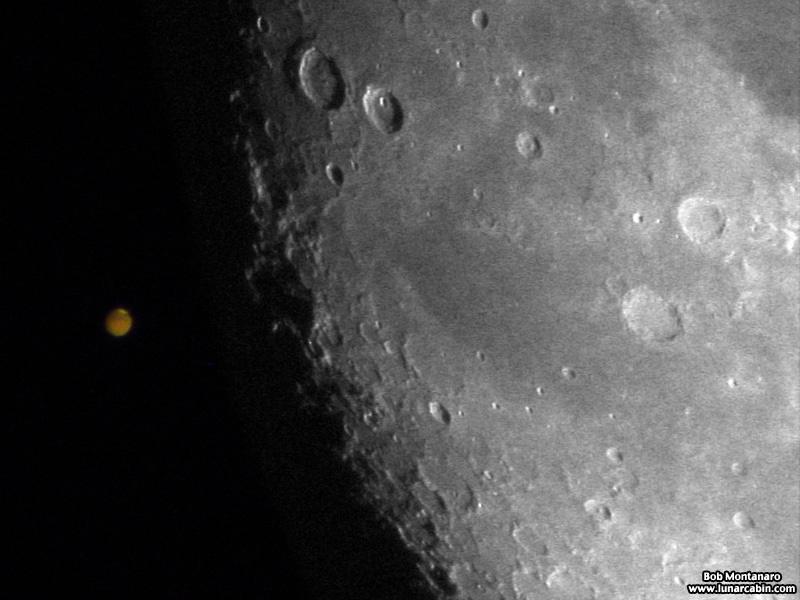 Back on 17 July 2003, using what was a primitive digital camera by today’s standards, the image below was captured of the Moon having a close encounter with Mars. The Moon is only about 250,000 miles away while Mars was about 35 million miles away that night so the whole thing is all about the Moon moving into Mars’ sightline as viewed coincidentally by us puny humans on the Earth. Note one of Mars’ polar caps made of frozen carbon dioxide and water ice is clearly visible surrounded by darker rocky terrain that gives way to the reddish-orange deserts making for a lot to see on an alien world far across the solar system while standing just a few feet away from my kitchen door. Left unsaid for now is the overpowering view of the Moon’s own rugged beauty. The MAVEN (Mars Atmosphere and Volatile Evolution) mission seeks to “…explore the planet’s upper atmosphere, ionosphere and interactions with the sun and solar wind…giving insight into the history of Mars atmosphere and climate, liquid water, and planetary habitability,” according to NASA. Five days and counting till launch! Go Atlas! Go Centaur! Go MAVEN!